This summer we had a group of interns at Alaska Public Media, and we wanted to integrate them into the video production team. I learned pretty much everything I know from a two-week intensive last winter with Carl Crum of Brazos Film & Video / Docshops, so I wanted to try to emulate that hands-on training, except I had about 4 hours. Even though our interns all had various degrees of video experience, it’s a completely different experience to light and shoot with DSLRs. There are so many parts to make a DSLR rig work, so I started by going through the Canon 60D menu, as well as the Magic Lantern menu, to prepare the camera for shooting. I passed around a one-sheet for all the important settings. Why is this checklist important? Every time you insert a Magic Lantern SD card, it brings up the most recently used settings. Plus we use our 60Ds for photography. So the settings can get changed pretty regularly. 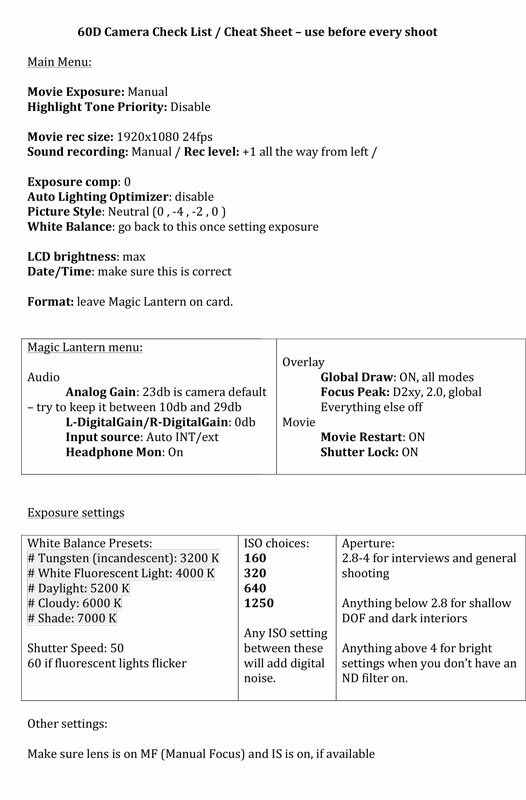 There are hundreds of menu options in the Canon and Magic Lantern menus, but this checklist goes through the core settings that can definitely make or break a shoot. It’s happened a few times where we come back from a shoot and realize we were shooting at the wrong frames/sec, or the audio was set on a wrong level. Print this out and check it every time! When we moved on to interview lighting, I purposely messed up one or two menu settings before asking an intern to take the reigns and figure out how to set up the camera correctly. That, combined with the pressure to light an interview, was stressful for the students, but they learned invaluable lessons on how to figure things out on their own. 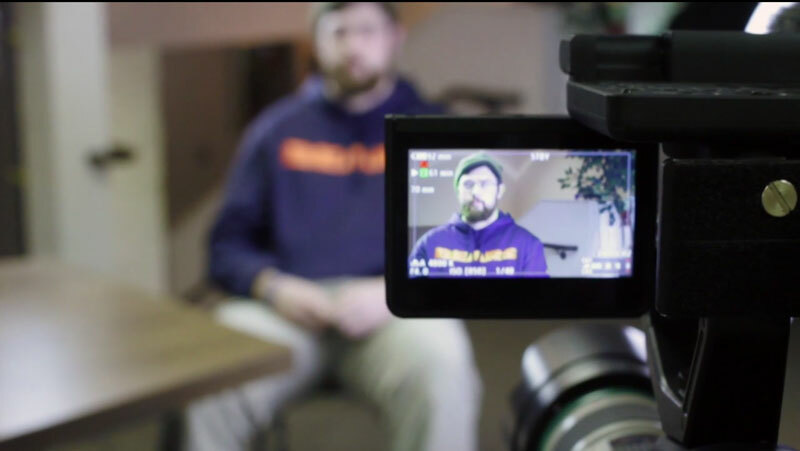 Once everyone had a chance to light, shoot, and actually interview a test subject, we ended the workshop and planned to meet the following day. I arranged with the Alaska Botanical Garden to have our interns shoot a Junior Master Gardener class in session. One shooter was on the 17-55mm for general shots, one was on a wide 11-16mm, and one was using a 70-200mm long lens on a monopod. I stayed away and let the interns try their hand at shooting on their own, which was a valuable lesson for everyone, because the wide lens was mistakenly set on auto focus (so, many of the shots were blurry and unusable), the long lens was accidentally set on 6400 ISO, and the 17-55mm rig had a Rode shotgun mic that was turned off for part of the shoot. Moral of the story, it was a great lesson! While the interns were shooting, I set up a LED light and a wireless LAV kit for an interview with our subject, and when the B-roll was finished I had the interns each take their stab at the interviewing with 4-5 questions. When we got back to the station, I walked the interns through a workflow for importing, organizing, and editing our footage. This part is the most time consuming, but it’s really important to give video students the opportunity to learn to edit with help nearby. 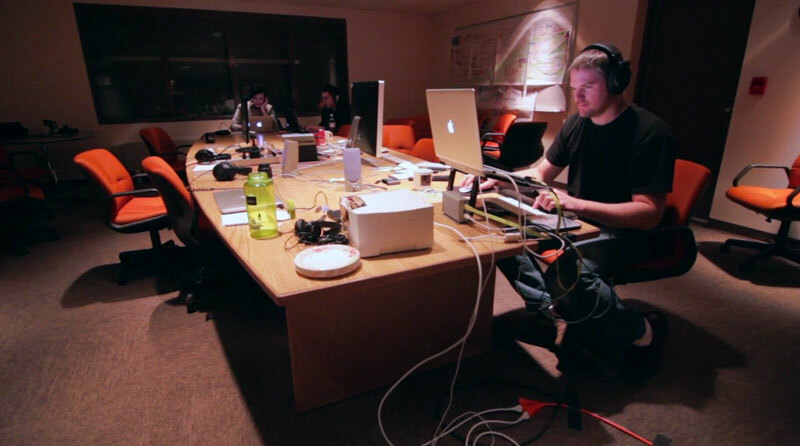 In Carl’s class, we spent 3 days editing our documentaries individually, with peers available to help at all times. Carl editing at the station. 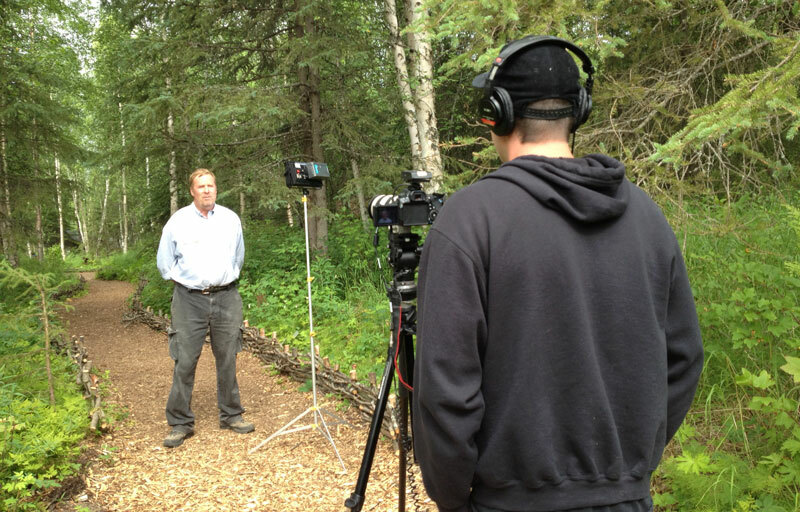 One of the interns, Sara Bernard, took the lead to edit the Alaska Botanical Garden video into a final product. Though I helped with the story, color correction, and audio editing, I’m really proud of Sara and her cohorts for putting this video together after just a few days of training, mostly on their own.